Two Trees Management Co., which has traditionally focused much of its efforts in Brooklyn’s DUMBO, has started a multimillion dollar renovation of its first Manhattan office building. It bought the 13-story property in the increasingly desirable Flatiron District for $130 million two years ago. Two Trees has begun to modernize the lobby of the 106-year-old building at 50 W. 23rd St. by adding new lighting and re-cladding the walls and floor with a white fiberglass reinforced concrete. The developer plans to use the same material on the exterior, which is also slated to get new glass canopies over ground floor doorways and windows. Since the building sits in the Ladies’ Mile Historic District, any exterior alternations must receive approval by the city’s Landmarks Preservation Commission. The company hasn’t officially applied to make the renovations yet but has been talking to the commission’s staff and plans to make a formal application soon, according to Jed Walentas, principal of Two Trees. Mr. Walentas said this first phase of the renovation should cost about $3 million. 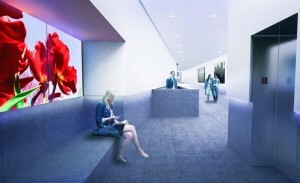 In a planned second phase, the building’s corridors and bathrooms will be renovated. The developer has yet to decide if it will upgrade building systems including electricity and air conditionings to make it more attractive to the tech and creative firms that have made the neighborhood one of the hottest in the city. They are the same types of tenants that populate Two Tree’s buildings in Brooklyn. Yet, Mr. Walentas notes that since each company’s needs are unique he plans to talk to tenants about their needs. Two Trees’ first project in Manhattan is Mercedes House, a 29-story mixed-use building at 555 W. 53rd St. with 1.3 million square feet of commercial and residential space. It is designed by Enrique Norten.